what a great upholstered headboard from U.O. with all the fixings (ie. 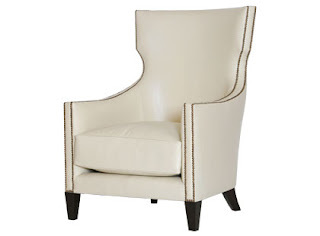 nailhead trim, great shape, & wallet-friendly). there is only one catch or i'd be ordering it up for my master bedroom....it only comes in a full/queen. and seeing that we just invested in a king so that our whole fam could sleep in the bed w/ us (babe and golden), this won't do. but for the other people in the world who are without kid, dog, and still enjoy smaller beds to cuddle w/ their significant others, this would be a great addition to any bedroom! oh my bad, female leather chair....won't this table look smashing by my beautiful, ivory leather piece of work! a perfect masculine match...and look at the cost of this little diddy.....pretty darn good if i say so myself....go get you one! 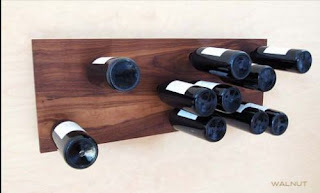 as if drinking wine wasn't fun enough, add this wine holder to any kitchen/dining room and you have really got something to talk about. i love the sporadic hole placements for the wine bottles! i don't know if i could keep the wine bottles in there...we tend to drink what we have at the house! but empties could display well too! if you don't go to antique stores or flea markets than you are truly missing out. i fell in love with big daddy's antiques ; there is only one problem....its in LA. but if you are looking for inspiration or just something different, check out his site (i assume its a "he" since the store is big daddy). and if you fall in love with something like i just did, you can always email "big daddy" and see if they ship. the only problem is that you might pay a whopping fee to get it here from cali....but none-the-less, it shows you that great things do exists and gives you instinctive to find something locally. i love this table. 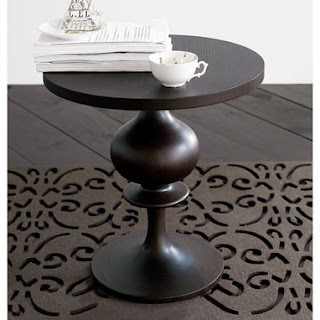 i think it would make a great table in between two linen club chairs or as a side table by a velvet sofa. 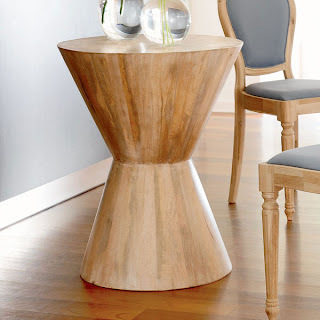 its just different from your regular, indonesian dark-wooden side table found in a lot of your local shops. it has a cool vibe to it. i love the idea of mixing it with different elements...placing a funky, glass lamp on it or using dark fabrics for your upholstery would look amazing next to this light wood. 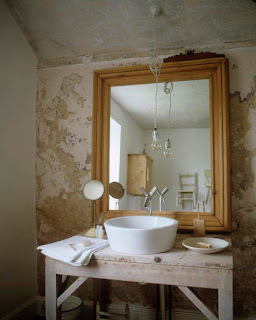 what a funky bathroom...i love the mixture of old and new. living etc called this "rustic modern" and i love the play of those words together as well as the actual outfitting of this bathroom. i guess there are things i love more than others in this space....i love what the actual sink sits on....an old table reinvented as a bathroom console is very clever (a little more interesting than purchasing the whole kit and caboodle prepackaged), the sink and faucet look amazing on the wood (the knob on the faucet is extra cool), and i love the propped up mirror. i think the walls are interested...i would love it against an old, exposed charleston brick wall more :) ! and the naked light bulb could be replaced with something a little more finished but still keeping with the simplistic nature of the room. all in all, the combination of rustic and modern make a great bathroom.....don't be afraid to mix and match....the possibilities are endless and the look will be a style all of its own! 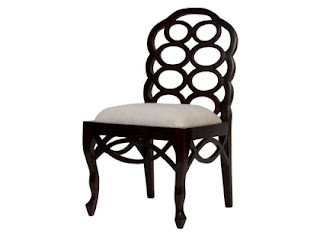 i love this chair and think that everyone needs something fantastic like this in their home. two of these chairs would be amazing as occasional chairs in a living room. i could not believe how well priced these chairs are. if you are in the market for something like this, you can find them here. one of the scenes last night inspired my blog for the day...it was at ryan's house. in the dining room he had three pagoda chandeliers hanging over his table. it looked so amazing. 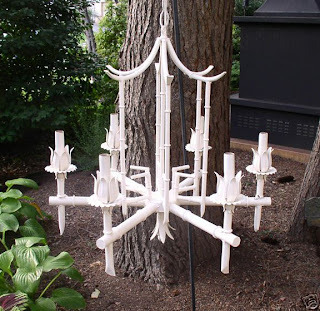 so i googled pagoda chandeliers and found this one on ebay...it has great potential. i would paint it chocolate brown or black or red...i would love to have three small pagoda's over a long, rectangular raw/ drift wood table. 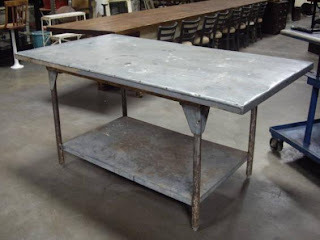 so cool.....or if you couldn't find a couple of these, you could just get this vintage one and use it over your table, or in the foyer, or in a powder room. i know i was suppose to be doing something crazy and exciting on this labor day weekend but its raining outside, my husband's fishing (or attempting to), and the baby's sleeping...so i decided to write a blog. i hope y'all are doing something a lot cooler than reading this on your labor day weekend! 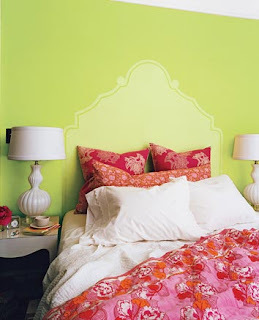 anyhoo....i love this idea of a stenciled on headboard. 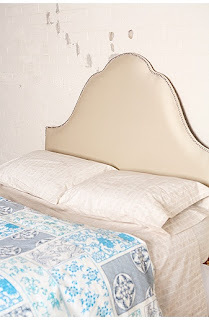 i think its a great way to give the look of a headboard w/out the commitment of having to actually purchase one. 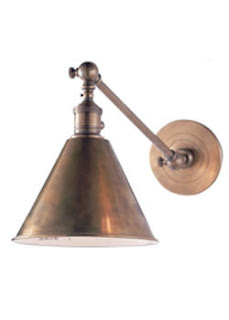 its fantastic for the budget friendly, yet stylish 20/30 year olds. 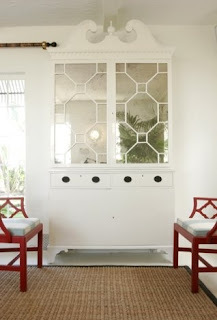 don't you think it would be great in a guest bedroom? and i love how they paired it w/funky bedding...if you decide to do this, explore the bedding at anthropologie and pick out an accent color for the walls. paint the headboard a shade lighter or darker than your wall color and to really spice it up, do the paint sheen in pearle and it will give luster to the headboard. when you are tired of this headboard or you have enough money in the piggy bank to actually purchase one, all you have to do is repaint the wall! to purchase this stencil go to http://www.stencil-library.com/docs/asseenin172.htm .